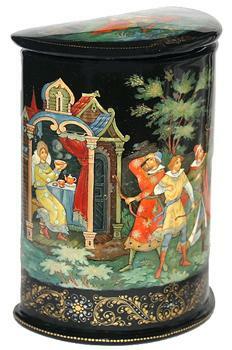 This attractive unique-shaped box is a creation of Vladimir Bogdanov (born 1956) whose favorite themes to depict are folklore and genre scenes. This talented artist is a participant of various exhibitions since 1985. His works are kept in the Art Fund of Russian Federation! This piece shows several scenes from the tale of Princess Frog.On the front surface we can see a moment when the old Tsar tells Ivan and his brothers to shoot their arrows blindfolded, into a random direction to find a wife. The arrows of Ivan's brothers land near the houses of the rich and beautiful maidens. The happy Tsar welcomes his daughters-in-law on the threshold of his palace.And we can see on the top of this casket, that I van has found his arrow in the swamp and the Frog has pick it up.But on the back side of a casket we can see a happy end when the Frog became a beautiful Princess and entertain a Tsar. The scenes are painted in bright tempera paints, and richly detailed with gold and silver paints. Gold and silver paints are also used to decorate the box's exterior with intricate ornaments. The box is made out of paper-mache. Black lacquer covers the exterior and red lacquer covers the interior of the box. The lid is hinged from the top of the scenes, and the box rests on a flat bottom. The work is signed on the top with the artist's name, Palekh, and the year of 2011.